Darien's George Reed (5) on the field during the second quarter of the football game against Bassick High School at Darien on Sept. 27, 2014. Brainstorming which athlete to highlight for the first edition of this series took all of about 15 seconds. Not only was George Reed a star athlete in the class of 2015 at Darien in both football and baseball, he’s genuinely one of the best young men I’ve come across in my four years covering the town. Despite only covering him for his senior year, Reed has been invaluable as an asset to me in terms of providing me with any contact information I might need, as well as a quote for any story at any time. 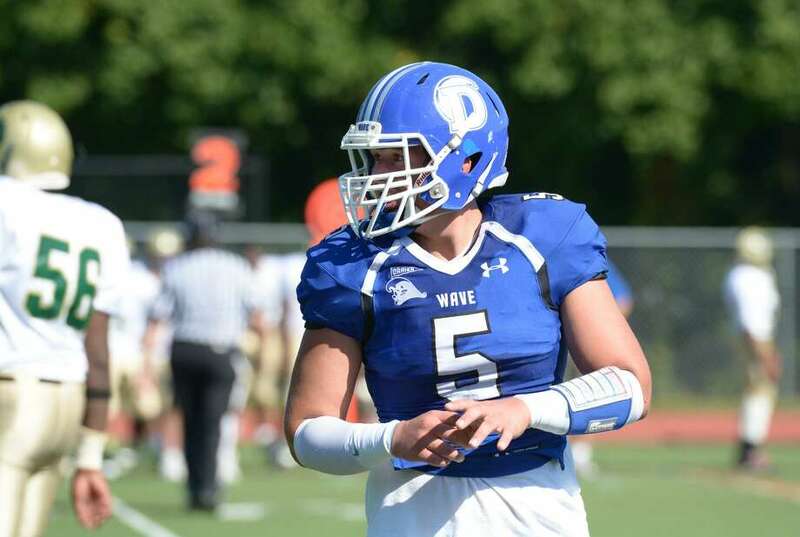 So, when you look at his life three years after leaving Darien High School, it’s little surprise that Reed is thriving on the field, in the classroom and in his budding professional career. The easiest place to start with Reed is where I met him, on the gridiron. Reed went to Union College in Schenectady, New York after graduating to pursue both football and baseball. After suffering his second ACL injury in his sophomore year, Reed opted out of the baseball program to focus on his physicality for football. Reed played defensive end at Darien, and graduated weighing about 230 pounds. He started his career as a pass-rush specialist at Union, but has since dropped 30 pounds and will begin his first full season at a new position in the fall. Reed made the position change because another player in the program—whom he said is probably the best defender on the team—was in his class and played his position, so he found another way to be on the field. Playing at one of the premier programs in the state made his jump to the college level easier, but not in the way you may think. Reed said that defensively, the schemes are much more advanced in college, but because he had played against the Darien offense in practice—as well as teams like New Canaan and Greenwich in the FCIAC—he was ahead of the curve in terms of understanding what opponents would try to do at the college level. Because of his injury, Reed will have a fifth-year to play football at Union in 2019 despite this season being his senior year academically. Reed already has a job lined up with the Fellowship of Christian Athletes in Baltimore when he graduates, but has worked it out so he’ll be able to use up his eligibility in that extra season. Reed’s versatility is one of the things that makes him great on the field, but it also translates to his academics. When Reed isn’t at school it’s routine to see him and other Darien grads supporting the continued success at Darien. According to him, that attendance is a combination of pride and nostalgia. If you ask football coach Rob Trifone or baseball manager Mike Scott, they’d tell you Reed has as much to do with it as anyone.